Let’s talk a bit about brisket. Of course, what you consider to be the brisket depends a little bit on where you’re from and when you’re asking. British brisket starts only at the bottom of the chest and extends back into what we’d call the plate; the Dutch brisket only starts at the front of the chest and extends upward into what we’d call the chuck. The American brisket actually straddles the edges of both the British and Dutch briskets, but ends sooner. 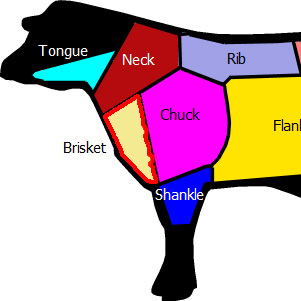 Largely, these butchering styles evolved around what cuts of meat were popular in a given place at a given time; animals were sectioned to maximize the size of the most desired cuts. England is known for its love of the carving table and particularly a “joint” of meat on the bone (a term that’s applied to any bone with meat on it), so keeping as much of the brisket with the rib as possible increased the size of the rib portions. The Dutch, on the other hand, have a large number of braised dishes in their traditional cuisine; keeping as much meat as possible with the shank maximizes profit. Cooked brisket flat from Cousin’s BBQ at the Dallas airport; by uberculture, on Flickr. 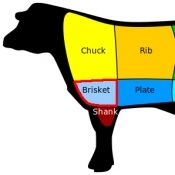 In the U.S., the brisket portion is popular as a cut unto itself; one cow usually provides two or three cuts of brisket depending on the size. It’s a little hard to diagram this without thinking in three dimensions, but the brisket is the front of the chest cavity of a cow, in essence; a smaller animal is divided in left and right halves, cutting the central bone in half, while larger animals can have two sides and a center cut separated. It’s the star of Texas barbecue and a traditional braised dish in American Jewish cooking (and why, we’ll talk about in another post), as well as being the cut used for Montreal smoked meat, a Canadian-Jewish specialty. But the brisket is actually two muscles which are sometimes separated. I assure you, this is a cross-section of the cooked brisket point. The fat has mostly melted away, but you can see the thick stripe in the middle where it was. Plus, if this was a brisket flat, the cow was about, mmm, nine feet tall. By grongar, on Flickr. 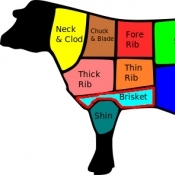 The part of the brisket closest to the cow’s navel–technically, the deep pectoral muscles–tend to be dense muscle fiber connected with collagen. That’s ultimately the lean, narrow part of a brisket, called the brisket flat. The other side of the brisket, closest to the front of the animal (technically, the superficial pectorals), ends up with beautiful fat and collagen marbled throughout; because it comes to a point, it’s known as the brisket point, or the triangle brisket. If you want to try both the point and the flat, well, you can ask the guy running the barbecue to give you slices from two different ends, or you can go get yourself a bowl of pho with both lean beef and fatty beef. Guess which cut of meat does double duty in pho restaurants? 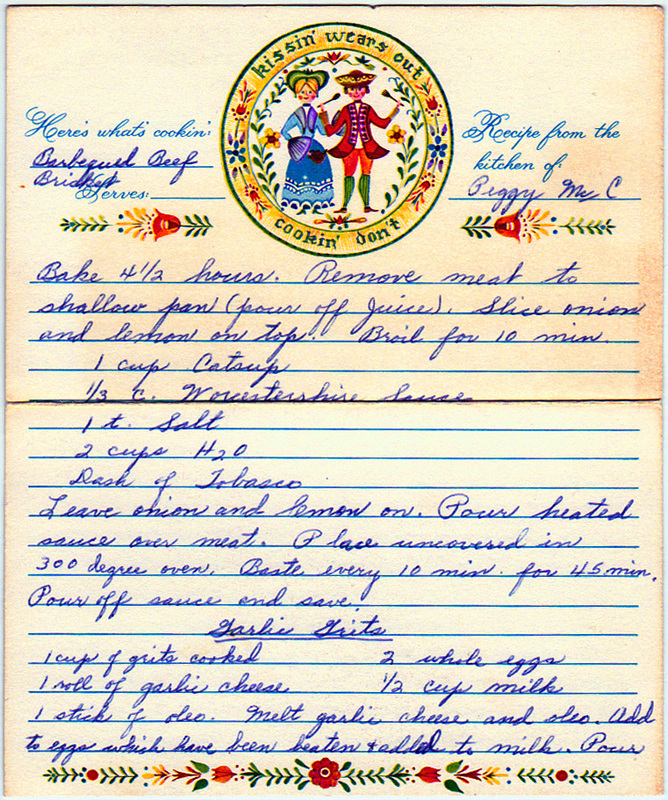 We’ll talk more about cooking methods and carving in the next post for today, the card for bar-b-q’d brisket. Bake 4-1/2 hours. Remove meat to shallow pan (pour off juice). Slice onions and lemon on top. Broil for 10 minutes. Leave onion and lemon on. Pour heated sauce over meat. Place uncovered in 300 degree oven. Baste every 10 minutes for 45 minutes. Pour off and save. Melt garlic cheese and oleo. 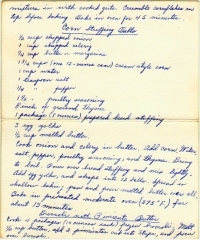 Add to eggs which have been beaten and added to milk. 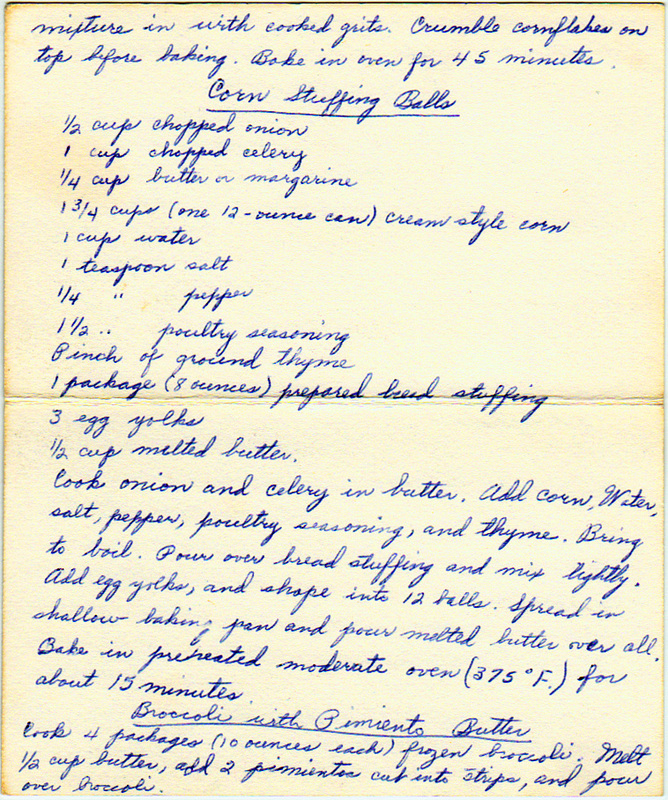 Pour mixture in with cooked grits. Crumble cornflakes on top before baking. Bake in oven for 45 minutes. Cook onion and celery in butter. Add corn, water, salt, pepper, poultry seasoning and thyme. Bring to boil. Pour over bread stuff and mix lightly. Add egg yolks and shape into 12 balls. Spread in shallow baking pan and pour melted butter over all. Bake in pre-heated moderate oven (375 deg. F.) for about 15 minutes. Cook 4 packages (10 ounces each) frozen broccoli. Melt 1/2 cup butter, add 2 pimentos cut into strips, and pour over broccoli. 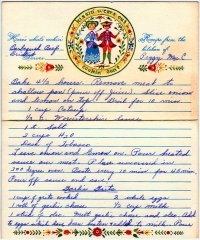 Recipes from the kitchen of Peggy McC.